Mass flow is the amount of solute or water that moves per unit of time. Mass flow is calculated as the product of volume flow and the concentration of the solute in that volume. Mass balance in the body refers to the relationship between the rates at which substances are taken into the body and/or produced by metabolism, and the rate at which they leave the body. A steady state exists when the rate of intake plus production and the rate of output are equal. Homeostasis refers the maintenance of a constant and optimal body content for each substance. The constancy requires the maintenance of a steady state despite relatively high rates of intake, production, and loss for some substances, and changes in those rates. The fundamental mass balance relationship for the nephrons is that the rate of excretion is equal to the sum of the rate at which a substance is filtered and the rate at which it is secreted, minus the rate at which it is reabsorbed. 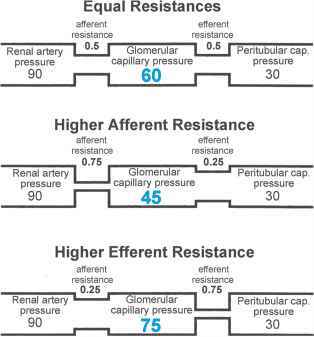 The filtration rate of a solute is the mass flow defined as the product of the glomerular filtration rate (GFR) and the solute concentration in the glomerular ultrafiltrate. The excretion rate of a solute is the product of the urine flow rate and the solute concentration in the urine. Inulin is a good indicator of the GFR because it is neither reabsorbed nor secreted; thus its rate of excretion is equal to its rate of filtration. The clearance of a substance is an index of the rate (in milliliters per minute) at which the solute is being removed from the renal plasma flow.